Welcome Home!!! This beautiful & luxurious, bright & sunny, 4BR/3BA + Den home is situated on a desirable large corner lot in the highly sought-after, private community of Terracina. Desirable features include soaring volume ceilings with crown molding, 32 porcelain floors laid on the diagonal, huge windows that let in plenty of sunlight, a gourmet kitchen with granite countertops and wood cabinets, freshly painted master suite, newer Samsung washer/dryer, and a newer epoxy floor in the garage. 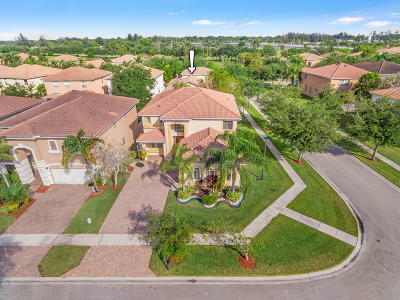 Centrally located just minutes from I-95 and Turnpike. Close to the Wellington Mall, Wellington Hospital, the beach and many restaurants. 10 minutes to CityPlace and the downtown area. This home has been pre-inspected and priced for a quick sale!! !